I am in love with this soup (surprise, ed surprise! I love all soup). Topped with a drizzle of smoked paprika oil and another of cilantro yogurt, discount it’s slightly spicy, creamy and very good. But before I go into more detail, let’s talk about garnishes. 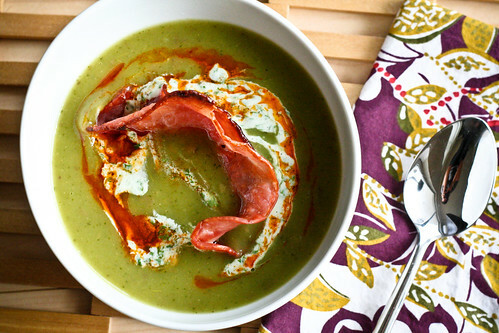 More specifically, cumbersome garnishes like the toasted slice of ham peeking out of this soup. I didn’t leave it whole for aesthetic reasons — I was just to lazy to slice it up. Big mistake. I had to eat around it and I missed the smoky ham bits with every bite. It wasn’t pretty. Moral of the story? Don’t add big stupid garnishes to your dish. Even if they’re pretty, they’ll just get in the way later. So, back to the soup. I bought some Purple Idaho potatoes at the market, thinking they’d be purple all the way through. I love how pretty and colorful they look on a plate! Turns out, only the skin was purple, and the insides were as creamy yellow as a standard Idaho. No matter, they were just as tasty. This soup is really simple — just saute onions, garlic and poblano peppers, add potatoes and chicken stock and you’re basically done. The smoked paprika oil and cilantro yogurt really complete the dish, and the crisped ham added a nice crunch and smokiness (bacon bits would be fabulous, too!). If you like potato soup and spiciness, then this is the soup for you. Next time, I think I’ll add some sauteed Spanish chorizo bits instead of the ham. Either way, I’m making this again. And soon! Omit the ham for a vegetarian soup. Or, if you love your meat, you can sub sauteed Spanish chorizo or bacon bits for the ham. Set a large pot over medium-high heat. Once it’s hot, add the olive oil and onions. Saute the onions for about 5 – 7 minutes, or until soft and starting to brown. Add the garlic and saute for an additional minute, then add the peppers. Continue cooking for 5 minutes, or until the peppers just begin to soften. Add the potatoes and stock and bring to a simmering boil. Cover, reduce the heat to medium-low and cook for 20 minutes, stirring occasionally until the potatoes are fork-tender. While the soup cooks, make the toppings. Stir the smoked paprika into the olive oil until mostly combined. Set aside. Use your blender to blend the yogurt and cilantro. Set aside. Place the ham slices under the broiler until the crisp and brown, then chop them into small bits. Set aside. Remove from heat and blend thoroughly until soup is smooth. Taste and add salt if needed. Ladle the soup into bowls, then drizzle with the smoked paprika oil, cilantro yogurt and sprinkle with the ham bits. Serve immediately. this really does sound delicious, and I like that you choose practicality and edibility over architectural aesthetics when it comes to garnishes! This soup looks so good. There’s nothing like a spicy soup to warm you up on winters day. I think I would try it with some applewood smoked bacon crumbled on the top, aesthetics be damned. It’s a shame that you did not like the garnish because it really is visually striking. But I can totally understand how it would get in the way. I really love the idea of chorizo; makes me want to run out right now and grab some! Am dying to make this – sounds great. Good photography too – was the reflection in the spoon intentional? p.s. i love your recipes! this one looks especially delicious. i love poblanos, but i’ve never cooked them any other way than rajas for tacos. i wonder if roasting them would work in this recipe–maybe add a bit of that smoky flavor it’d miss without the ham or bacon? boltchloer – Oh, how I miss the USQ greenmarket! I worked a block away from it…it was amazing! I do love me my purple potatoes! Another winner. Love the addition of the paprika oil and cilantro yogurt. Also like the idea of Spanish chorizo.